Working with a Mitchell nib isn't easy, they can catch on the paper, they can drop unexpected blobs onto your work, and the reservoir has an extremely upsetting habit of falling off just as you are about to finish you piece, leaving something that looks like you've squashed a fly on your artwork. Not good. All this is worth it when you get in the zone though, almost like meditation, calligraphy can absorb the mind so completely due to the concentration required to get all the aspects right, mind to hand coordination, all the while remembering your pen angle and, of course to spell the words in your piece correctly. For me, this last element has always been the biggest challenge. Today the fashion is to use pointed nibs, creating the think and thin lines of your letterforms, not through the broad nib, but by the amount of pressure you apply when writing, just like with copperplate calligraphy. Pinterest is full of work done in this way, fun and light. When I trained as a calligrapher back in 1992, we were taught formal lettering using broad edge nib dip pens. It is still my weapon of choice for any formal calligraphy job. Mitchell nibs come in different widths of nib, you slip a reservoir on to the back of it, which holds a small pool of ink for you to write with. Some say fill with a brush, but I've always been the impatient type; so I dip straight into the ink pot. Just check you aren't about to land a huge ink spot onto your work by having too much ink in the pen. If you are unsure, watch my video. In it I show you the 3 nibs I selected to go in my Essential Calligraphy Kit. I picked the Leonardt 30 as the perfect beginners nib. With it comes the Leonardt 259 which needs a little more pressure and is simular to the Nikko G that many American calligraphers champion. 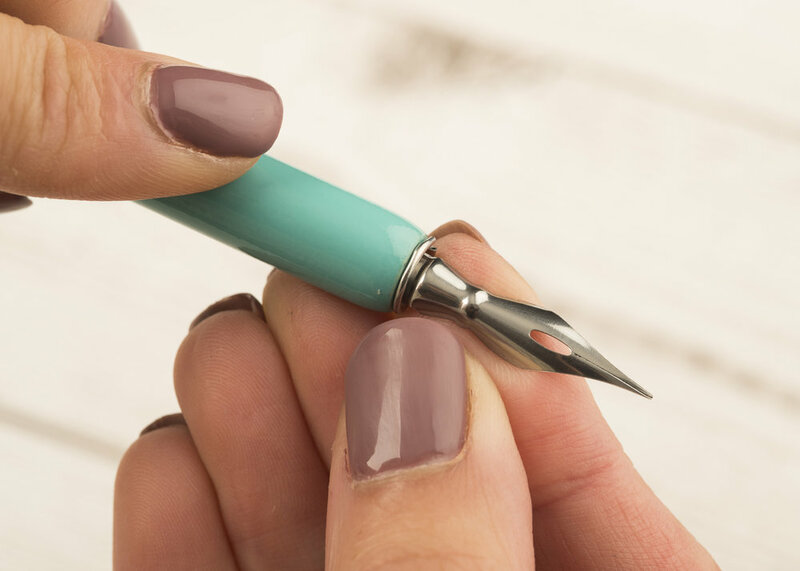 The final nib I selected for the kit is the Principle, which can take some getting used to, so try this one once you have got the hang of working with a nib. The reason why I included is that although it’s more challanging to use, it gives you beautifully fine lines and a dramatic contrast from thin to thick. At the moment I am trying out new pointed nibs that I haven't tried before, once I've done that my next project is to have a go at making a cola pen. Take a look at this selection via MyArtistSoul on Flickr. They are made cutting the tin from drinks cans to make a broad, but flexible nib. This looks very much up my street, I will get back to you with my results. Until next time, enjoy your own lettering adventures.